Stats and data can be very dry but with some attractive or fun images, you can make them interesting. On social media you have a second or so to attract someone’s attention. A dull text tweet or post may get limited views or clicks. (See how much more engaging a tweet with an image to illustrate a statistic is: Breast Cancer Now vs British Heart Foundation prevalence tweets.) Whereas one with a creative image may encourage someone to pause and read more. Here are some examples of tweets which include graphics to illustrate data or statistics. Totalisers are a great way to illustrate fundraising targets and successes (see Richard Sved’s Blue Peter blog post if you are not sure). But count-up stats can work for other things too. Think, number of hedgehogs rescued or Big Knit hats knitted. 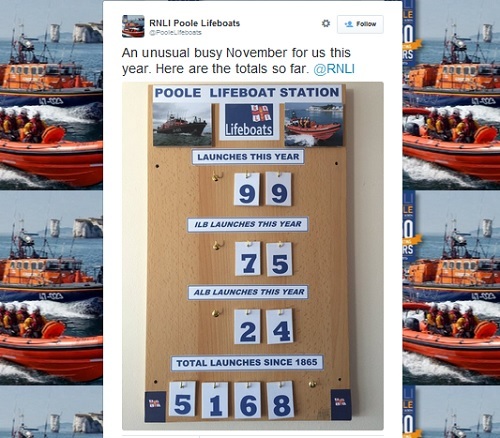 Many of RNLI’s lifeboat stations have their own twitter accounts which they use to share details of launches. This example from RNLI in Poole shows the running total of launches over the year and since 1865 as displayed on a noticeboard in the station. 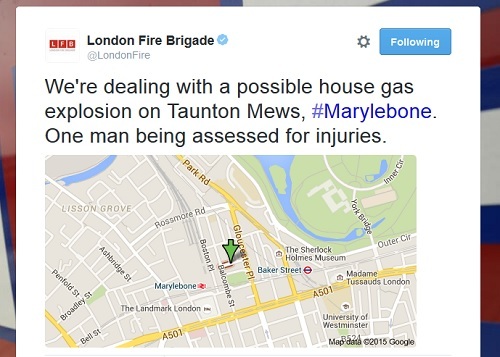 The London Fire Brigade share details of the incidents they are dealing with. 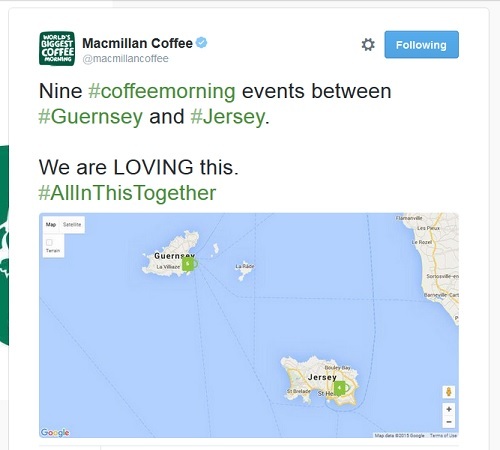 This tweet uses a map to show where an incident is happening. Other tweets use photos from the location. Maps can go even further to bring an event to life, especially if they show the remoteness or danger of a place. 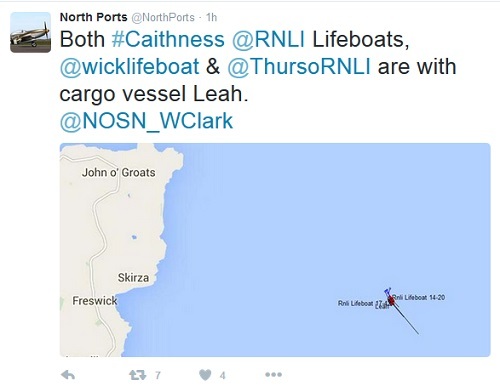 This tweet from a boat enthusiast uses an app called ShipFinder to illustrate an RNLI shout off the coast of John O’Groats. When using third party data, do check the data protection and copyright issues. 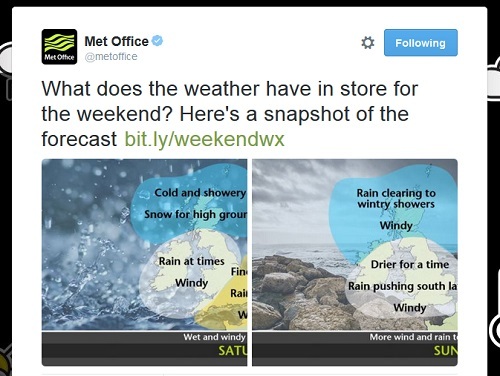 Here’s another nice use of maps (I like maps) from the Met Office who are fab at social media. It contains lots of information. There’s a background image to give a sense of the weather as well as UK map with blobs showing different summaries for areas with text over the top. Infographics are still a strong way to present data. If done well they can tell a story. 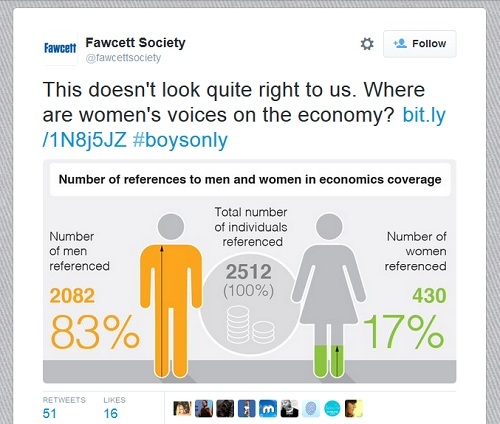 This graphic from the Fawcett Society shows the number of references to men and women in economics coverage. 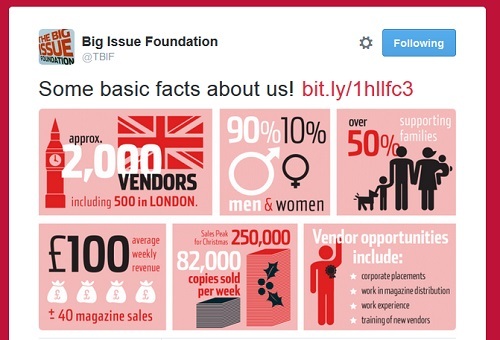 The Big Issue Foundation regularly share this graphic of their impact. There is a lot to take in but it presented in an engaging and attractive way. 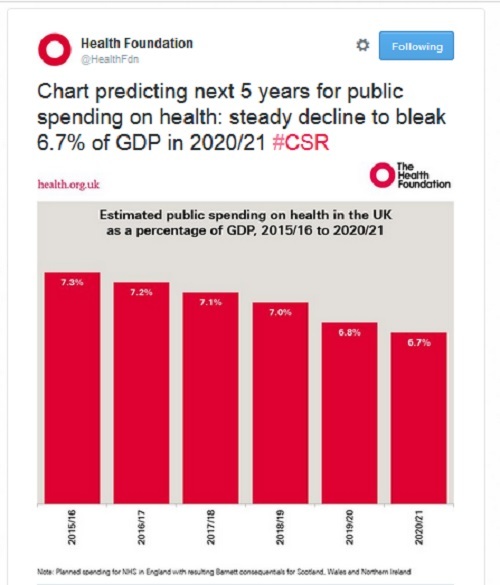 This tweet by Health Foundation responded to the Chancellor’s Spending Review. It clearly and simply illustrated their data. Unfortunately it doesn’t link anywhere for more information. Stats can often just come across as numbers. 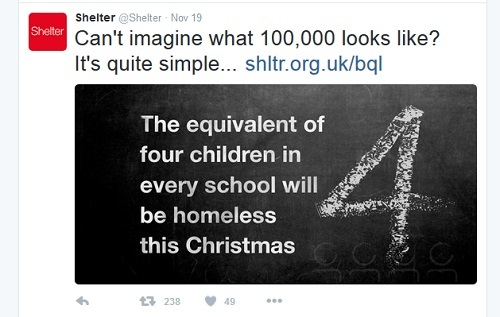 Shelter’s Christmas campaign focuses on the 100,000 children who will be homeless this Christmas. This tweet helps to illustrate what that huge number actually means. A giant 4 on a blackboard brings it to life. This JustGiving blog post on the power of infographics shares lots more examples and gives tips about how to produce them. Graphics don’t have to be professionally done or cost lots of money. Howard Lake’s graphic traffic course shares lots of great tips about using anything and everything to bring your data to life. 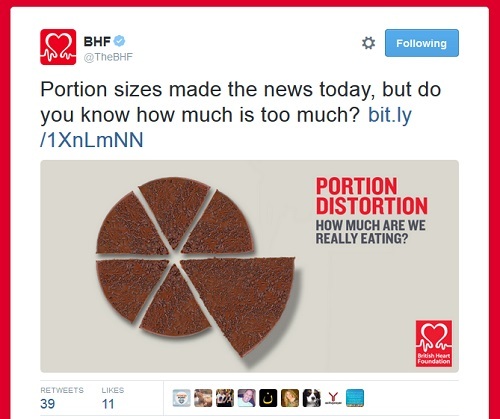 This BHF pie chart of a cake showing portion sizes is really clear and eye catching. 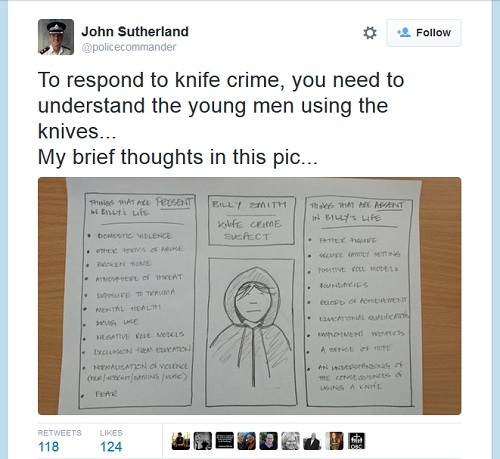 This hand-drawn image from John Sutherland, a Met Police Officer connects the reader with the issues on a human level. It generated lots of interaction including some very lengthy conversations as comments underneath. Accessibility – remember that not everyone will be able to see your graphic. Include the data in the tweet or post in full or as a summary with a link. Links – include a link so people can read more or take some action. Source – check and reference the source for your statistics and third party graphics. Also think carefully about sharing sensitive data about live events. Get permissions or preserve anonymity where appropriate. Use your assets – do you have graphics in print, someone in the team with lovely handwriting or drawing skills? Maybe you have other tools lying around such as lego or magnetic letters? Check your sizes – use this size guide from Sprout Social. Please add your favourite examples in the comments box. I am especially keen to find more count-up and creative graphics as I couldn’t find very many good examples. Have graphics led to more engagement for you? How much time or budget do they take to produce? Have you got top tips for producing graphics on a shoestring? Please add your comments, I’d love to hear from you.